Cook a variety of dishes Dial control with 3 temperature settings helps you control the heat. Serve enough for the whole family 6-qt. capacity accommodates meals for large parties. Enjoy durability Stoneware pot offers strength for long-term use. Make cleanup simple Removable pot and lid are dishwasher safe. Try a new meal Recipe book included. Team colors design So you can showcase your team spirit. Go Nebraska Cornhuskers! Personalize your tailgate parties and game day celebrations with a Crock-Pot 6-Quart Slow Cooker designed with your team’s logo. This portable Crock-Pot Cook & Carry Manual Slow Cooker is made for tailgates and get-togethers anywhere the game is going on. Manual High, Low, and Warm settings make it easy to cook and serve a wide range of winning dishes while cheering your team on to victory. Convenient features include a locking lid to prevent spills during transport, and a removable 6-quart oval stoneware and glass lid that clean easily in the dishwasher. 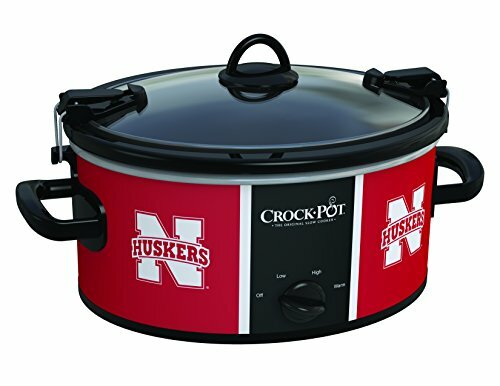 Designed with the official team logo, it's a must-have slow cooker for any loyal fan.